MB has some pretty fantastic people that work at the firm. We are also are proud to brag about our spouses, kids and grandkids! Read about our athletes, musicians, artists, dancers, scholars, fundraisers, and all round Good People! 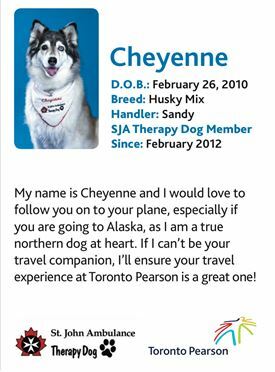 Sandy Mark Lee's beautiful therapy dog, Cheyenne, is now with the Pearson Airport Welcome Team Dog Division providing therapy to thousands of stressed passengers each day. Here is a CTV news clip. 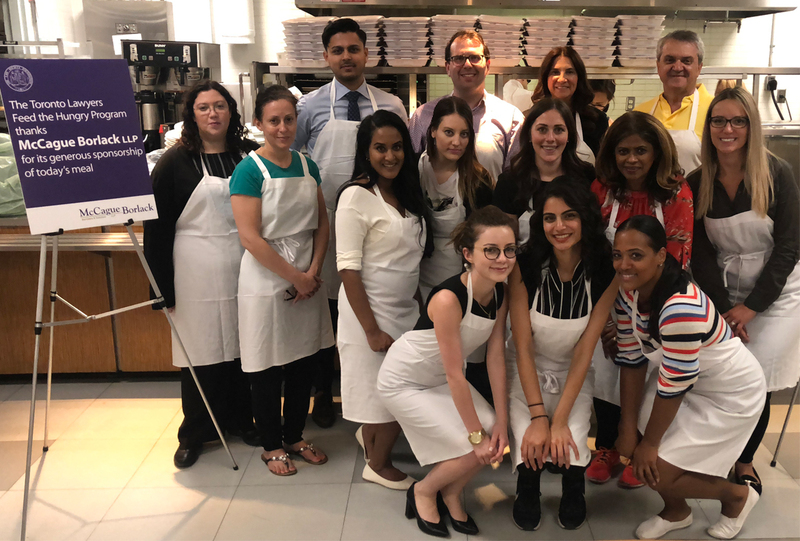 Again in June, MB sponsored a dinner for the Toronto Lawyers Feed The Hungry program. As well, 15 firm members volunteered their time to serve 400 hot meals to those less fortunate. 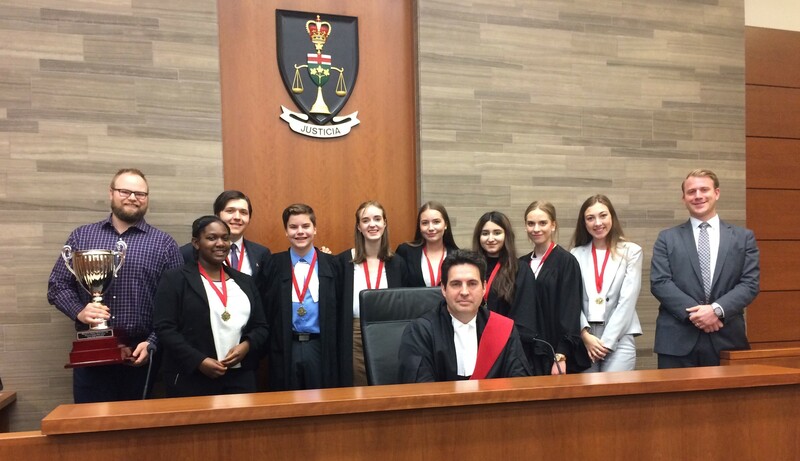 The next generation (“TNG” ) of “Suits” gussied up in Court robes to compete for the Kitchener/Waterloo branch of the Ontario Justice Education Network’s “2018 Waterloo Region High School Mock Trial Tournament”. McCague Borlack lawyer, Brian Murphy, took on the role of judge in the preliminary rounds, along with his lawyer colleagues from the Kitchener Waterloo area. The final round involved Secondary School students in the roles of lawyers for the defence and prosecution(crown) in the trial of a Mr. Rogers, who had been charged with Manslaughter! The case was heard by a real Judge. Taking home the “Margaret Janzen Memorial Cup” was Galt Collegiate Institute. 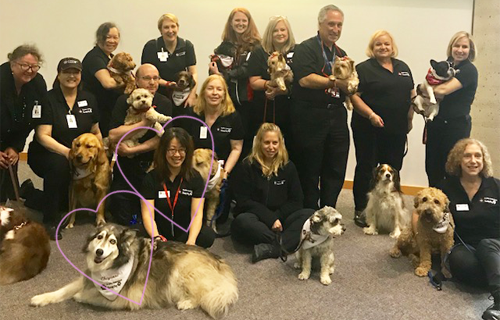 On April, 25, the St Johns Ambulance team asked MB's Sandy Mark Lee and her amazing companion Cheyenne to attend an event at 4900 Yonge Street to assist the people that were traumatized by the events this past Monday. Sandy, Cheyenne, and friends were there providing comfort to so many. WTG! In February, MB sponsored a dinner for the Toronto Lawyers Feed The Hungry program. As well 15 firm members volunteered their time to serve a hot meal to those less fortunate. Ottawa held their annual gingerbread house competition. Voting was done by the whole firm and the winner was No. 2, who got all of the leftover candy they could stuff in their pockets! See Photo album for pics. Shout-Out to MB's Kelly Sneep (Toronto) and Rebecca Parker (Ottawa) - our newest paralegals who passed this month! 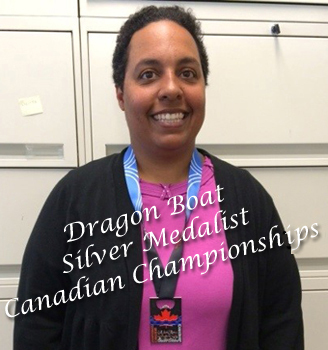 Congratulations to MB's Ingrid Schurr and her Dragon Boat Team on taking silver at the Canadian Championships! CONGRATULATIONS to everyone at MB for a great Fundraising Challenge—together all firms raised over $185,000 for the Daily Bread Food Bank! MB raised $1,642. WTG Students for leading a successful campaign! 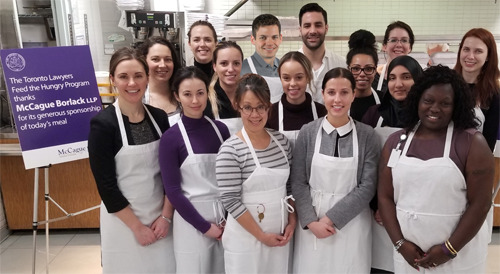 Every year, articling students at Toronto law firms organize a competitive holiday food and donation drive on behalf of Toronto’s legal community, with all proceeds going to Daily Bread Food Bank. This challenge has raised over $2 million over the years. Last year our firm was successful in raising over $2,700! They look forward to our support this year! Watch this space for some fun event pictures! Donations can be made in cash, or online here. Plus the students are accepting food donations. 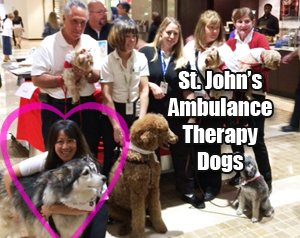 Everyone’s favorite therapy dog, Cheyenne and her handler MB's own Sandy Mark-Lee was at the St. John Ambulance Therapy Dog Fall Awareness day @ the Exchange Tower! Thanks to Kathryn Stroscher, HR Manager, who led another successful "Take your kids to work" day! 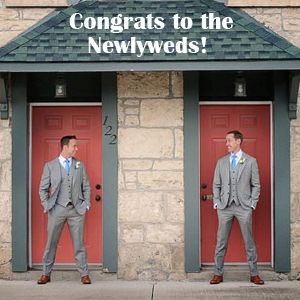 Congratulations to Patrick and Michael (A Partner at MB) who were married this week end in their own backyard in Guelph. All our best wishes! 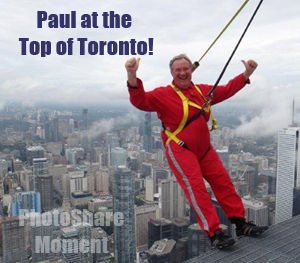 MB's Founding Partner Paul McCague is on the Top of Toronto!